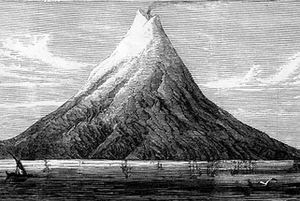 The 1883 eruption ejected more than 25 cubic kilometres of rock, ash, and pumice , and generated the loudest sound historically reported: the cataclysmic explosion was distinctly heard as far away as Perth in Australia approx. 1,930 miles (3,110 km), and the island of Rodrigues near Mauritius approx. 3,000 miles (5,000 km). Near Krakatoa, according to official records, 165 villages and towns were destroyed and 132 seriously damaged, at least 36,417 (official toll) people died, and many thousands were injured by the eruption, mostly from the tsunamis which followed the explosion.